The outhaul: a 6 X 1 purchase block and tackle runs from the end of the wish-boom and clips to the clew of the sail (A) The line then runs forward from the block on the boom (over a small block shackled to the clew, B) to the controls, photo (2) below. As shown below in (2) the outhaul line runs to a block, and a 2:1 purchase (C , the yellow line below) giving a total purchase pulling the sail taut of 12:1 on most boats. 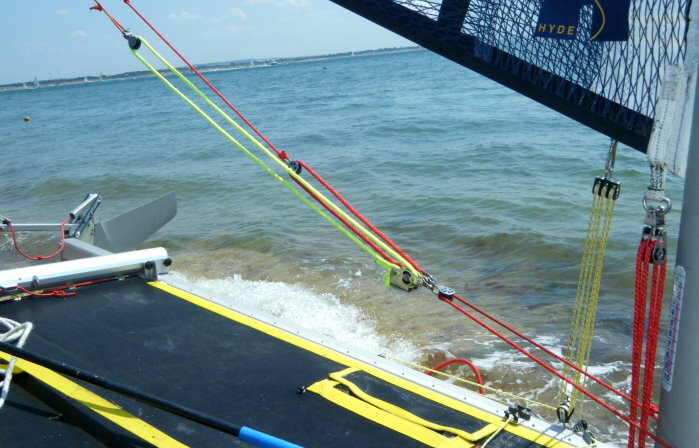 The yellow line is controlled at a v-jammer block, D, pulling against a line looping around the mast (E) which secures the control lines, and allows them to be in easy reach when sailing. slack sail foot sailing off the wind, when main sheet tension is released. 1) Raise the sail (more here) and take up the initial slack on the downhaul (more) to hold it. This is the position the rig will be left in when waiting to go, near the water. 8) Set the inhaul. John Peperell comments: In-haul setup is a fine judgment. 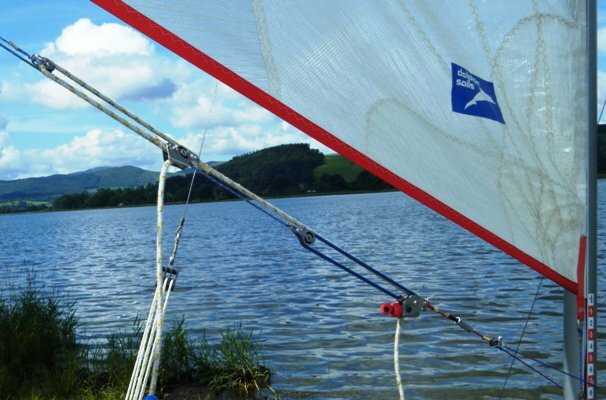 The easiest way of setting up is to apply full main sheet tension (so that the sail foot slackens) and at the same time just tighten the inhaul. On releasing the main sheet the sail foot will remain slack, and probably wrinkled (folded) at the clue. The inhaul should now be eased a little to eliminate the worst wrinkles. This will give the basic inhaul setup and could be left unaltered for the time on the water. wish-boom length.) I like to start with my outhaul set up with full tension on the sail clue i.e. flat sail. I mark this point on the sail foot with red tape using the outhaul adjusting block as marking guide. I then release the outhaul making sure there is enough adjustment line to fully slacken the sail. I now mark this point on the sail foot again with red tape. This will give you the range of outhaul adjustment from full sail to flat sail. You could then use green tape to give you a medium sail camber setting. 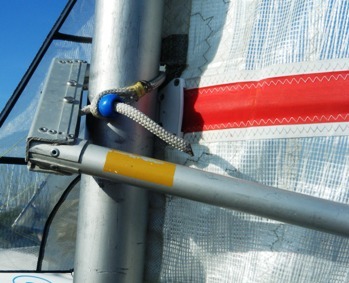 Photo 4 below shows how on this boat the inhaul (the thicker blue line above "G") is taken to the outhaul pulley block (rather than being separately clipped to the clew as in the boat above). 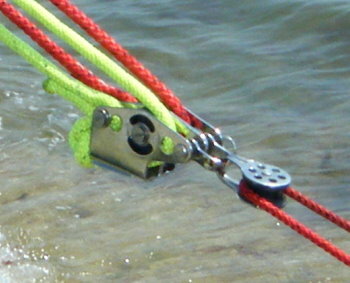 The mainsheet clip then goes round the outhaul and inhaul, onto a small ring fastened to the clew ring, so that the two lines run freely through it. The elaboration was to also pull the inhaul further in and down when both are fully released----it certainly gives a spinnaker-like belly, and seemed to give some boat-speed at Marconi, but you need a very long downwind leg (as at Bala sometimes) and the inhaul is hard to release after being under high load. As said above, this note is more an illustration of playing around with possibilities.